During World War One, Germany’s Kaiserliche Marine often sallied forth with light units and sometimes even battle cruisers to harass English fishing and merchant vessels and to bombard English coastal towns. One of these minor raids occurred early in the morning on October 17, 1916 when the German cruisers SMS Brummer and SMS Bremse chanced upon a convoy of twelve merchantmen escorted by 2 armed trawlers and 2 destroyers – the HMS Strongbow and Mary Rose. 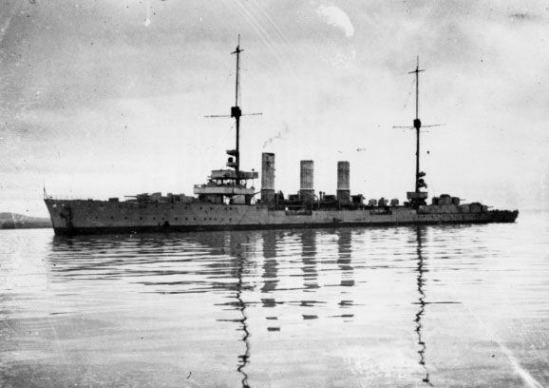 The Brummer and Bremse had been designed as minelaying light cruisers and were among the most modern ships in the German cruiser fleet at the time of the action. Mistaking the German ships for British cruisers, the Strongbow and Mary Rose failed to engage the Brummer and Bremse until they were fired upon at the relatively close range of 2,700m. By comparison, the opening salvos of the Battle of Jutland earlier in the year had occurred at 14,000m. The two British destroyers were quickly sunk (the Mary Rose joining her earlier namesake in Davy Jones’ Locker) and the German cruisers proceeded to attack the now vulnerable merchantmen. The Brummer and Bremse sank 9 of the vessels before breaking off the engagement to avoid any Royal Navy response. The cruisers successfully returned to port and survived the war only to be scuttled in Scapa Flow in 1919.